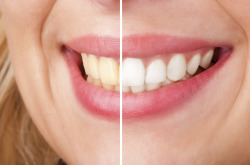 Our Dental Practice in Schaumburg Offers Teeth Whitening! With so many foods, drinks and habits that cause the teeth to stain, teeth whitening has become one of the most requested cosmetic dental procedures. At our Schaumburg dental practice, Dr. Thomas Brammeier proudly offers teeth whitening for families! Although there are many different tooth bleaching products on the market, they all work the same basic way, containing active ingredients such as carbamide peroxide or hydrogen peroxide. When the peroxide oxidizes on your teeth, it breaks apart the molecules in the stains on the enamel. Depending on the exact formulation your dentist selects for you, this chemical process can leave your teeth anywhere from one to eight shades lighter. Dr. Brammeier has found that the best method of whitening is to make custom whitening trays for the patient that fit their mouth exactly. Patients then load the whitening gel in the trays and wear them for 30 to 60 minutes a day for 8 to 10 days. The patient can then keep whitening until they are happy with the shade of their teeth. If they want to keep whitening after using the 8 to 10 days of their whitening kit, they can come in to our office to purchase more whitening gel. This method has become the "gold standard" of whitening because the patient has complete control of a professional whitening system. This is far different that in-office whitening because there is limited whitening that can be accomplished in an hour appointment. We also offer the same effective whitening process in a standard tray kit that will fit all adults at a reduced cost over the custom trays. The kit has ten sets of upper and lower trays. It's very common to experience some sensitivity following the procedure. For most patients, this subsides relatively quickly, but it means that some people with teeth that are more sensitive might not be good candidates. If your teeth continue to be painful for an extended period, you might need to find a different product or discontinue whitening. You also need to consider previous work such as crowns you might have had done, as they won't respond to the whitening and might not match your enamel after the procedure. Teeth whitening is a simple way to drastically improve the appearance of your smile, but it's not as long-lasting as other cosmetic procedures you might get. Generally speaking, the results last up to a year. You can extend the life of your whitening by avoiding foods and drinks that can stain. You also should avoid smoking. If you're tired of being embarrassed or hiding your teeth because you don't like their color, it's time to let Dr. Brammeier help! For teeth bleaching services in Schaumburg, IL, make your consultation appointment with us online or contact us by calling (847) 985-8100 today!